Photo #1 : This candle wick is in need of a trim. Notice the large, fat flame and the wick is about 1/2" long. It is too high, too hot and consuming your candle much quicker than need be. 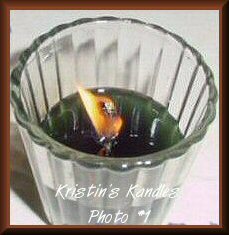 Photo #2 : This shows the wick that has been trimmed to 1/4". The flame is a nice size and it will not smoke or cause excess soot. Remember it is a safety factor as well as getting a longer burn time from your candle. Tips- to help you get the most enjoyment from your candles. Always read WARNING label on the bottom of your candle before lighting. * Never leave a candle burning unattended! *To prevent fading, keep candles out of direct sunlight. *Always burn candles in proper holder, as they will burn better and longer. * When extinguishing your candle, dip wick into the liquid wax, using a wick dipper or non-flammable instrument, then reposition wick in upright position, this helps eliminate smoking. * Always keep wick trimmed to 1/4" to eliminate smoking. * Keep candles out of drafts. Drafts cause flames to flicker, and smoke is released when the flame is disturbed. * Should a candle burn unevenly due to a draft consider this. Carefully push the wick towards the higher side. If this causes dripping, extinguish the flame, let it cool for an hour, then relight the candle. Repeat this practice a few times and the candle will repair itself. Always burn your candle one hour per inch of jar. For example, if you have a 4-inch jar candle, burn 4 continuous hours then extinguish. This breaking in process insures that it will perform better and burn evenly throughout the life of the candle. Never burn cracked or chipped jar candles. * Never allow a container candle to burn all the way to the bottom, the flame could cause the jar to break. If your candle develops a carbon buildup on your wick commonly referred to as a fragrance mushroom, this is a reminder that you have purchased a handmade, highly scented candle. If you see a carbon buildup on the wick, extinguish the candle, trim the wick to 1/4", relight and enjoy! Burn only on heat resistant surface. Keep from drafts. 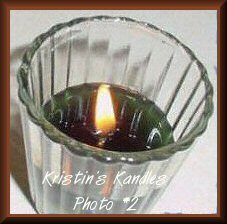 Do not burn candle when wax is less than 1/2" from bottom. Do not touch or move candle while burning. Never leave candle unattended. Keep out of reach of children and pets. Keep wick trimmed to 1/4" to avoid smoking.